This short tutorial explains the use of Excel NETWORKDAYS and WORKDAY functions to calculate workdays with custom weekend parameters and holidays. Microsoft Excel provides two functions specially designed for calculating weekdays - WORKDAY and NETWORKDAYS. The WORKDAY function returns a date N working days in the future or in the past and you can use it to add or subtract workdays to a given date. Using the NETWORKDAYS function, you can calculate the number of workdays between two dates that you specify. In modem versions of Excel 2010, 2013 as well as coming Excel 2016, more powerful modifications of the above-said functions are available, WORKDAY.INTL and NETWORKDAYS.INTL, which let you define which and how many days are weekend days. And now, let's have a closer look at each function and see how you can use it to calculate working days in your Excel worksheets. 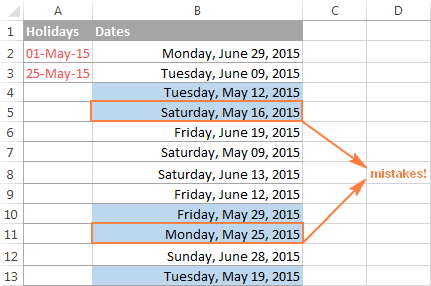 The Excel WORKDAY function returns a date that is a given number of working days ahead of or prior to the start date. It excludes weekends as well as any holidays you specify. The WORKDAY function is purposed for calculating workdays, milestones and due dates based on the standard working calendar, with Saturday and Sunday being the weekend days. WORKDAY is a built-in function in Excel 2007, 2010, 2013 and Excel 2016. In earlier versions, you need to enable the Analysis ToolPak. Start_date - the date from which to start counting weekdays. Days - the number of workdays to add to / subtract from start_date. A positive number returns a future date, a negative number returns a past date. Holidays - an optional list of dates that should not to be counted as working days. This can be either a range of cells containing the dates you want to exclude from calculations, or an array constant of the serial numbers representing the dates. Now that you know the basics, let's see how you can use the WORKDAY function in your Excel worksheets. To add workdays, enter a positive number as the days argument of a WORKDAY formula. To subtract workdays, use a negative number in the days argument. Where A2 is the start date and C2 is the number of non-weekend days behind (negative numbers) or ahead of (positive numbers) the start date, no holidays to exclude. WORKDAY.INTL is a more powerful modification of Excel WORKDAY function that works with custom weekend parameters. As well as WORKDAY, it returns a date that is a specified number of workdays in the future or in the past, but lets you determine which days of the week should be considered weekend days. The WORKDAY.INTL function was introduced in Excel 2010 and so is not available in earlier Excel versions. Start_date - the initial date. Days - the number of working days before (negative value) or after (positive value) the start date. If the days argument is supplied as a decimal number, it is truncated to the integer. Weekend - specifies which weekdays should be counted as weekend days. This can be either a number or a string, as demonstrated below. "0000011" - Saturday and Sunday are weekends. "1000001" - Monday and Sunday are weekends. At first sight, weekend strings may seem superfluous, but I personally like this method better because you can make a weekend string on the fly without having to remember any numbers. Holidays - an optional list of dates you want to exclude from the working day calendar. This can be a range of cells containing the dates, or an array constant of the serial values representing those dates. Well, the pretty big bulk of theory we've just discussed may seem quite complicated and confusing, but trying your hand at formulas will make things really easy. On our dataset, with the start date in cell A2 and a list of holidays in A5:A8, let's calculate workdays with custom weekends. Note. Both Excel WORKDAY and WORKDAY.INTL functions return serial numbers representing the dates. To get those numbers displayed as dates, select the cells with the numbers and press Ctrl+1 to open the Format Cells dialog. On the Number tab, select Date in the Category list, and choose the date format you want. For the detailed steps, please see How to change date format in Excel. weekend argument in the WORKDAY.INTL function is invalid. The NETWORKDAYS function in Excel returns the number of workdays between two dates, excluding weekends and, optionally, the holidays you specify. Start_date - initial date from which to start counting working days. End_date - the end of the period for which you are counting workdays. Both the start date and end date are counted in the returned number of workdays. Holidays - an optional list of holidays that should not to be counted as work days. Like NETWORKDAYS, Excel's NETWORKDAYS.INTL function calculates the number of weekdays between two dates, but lets you specify which days should be counted as weekend days. The syntax of the NETWORKDAYS.INTL function is very similar to NETWORKDAYS', except it has the additional [weekend] parameter that indicates which days of the week should be counted as weekends. The weekend argument can accept either a number or a string. The numbers and weekend strings are exactly the same as in the weekend parameter of the WORKDAY.INTL function. The NETWORKDAYS.INTL function is available in modem versions of Excel 2010, 2013 and Excel 2016. The following screenshot proves that both formulas return absolutely identical results. Using the WORKDAY and WORKDAY.INTL functions, you can not only calculate workdays in your Excel worksheets but also highlight them as your business logic requires. 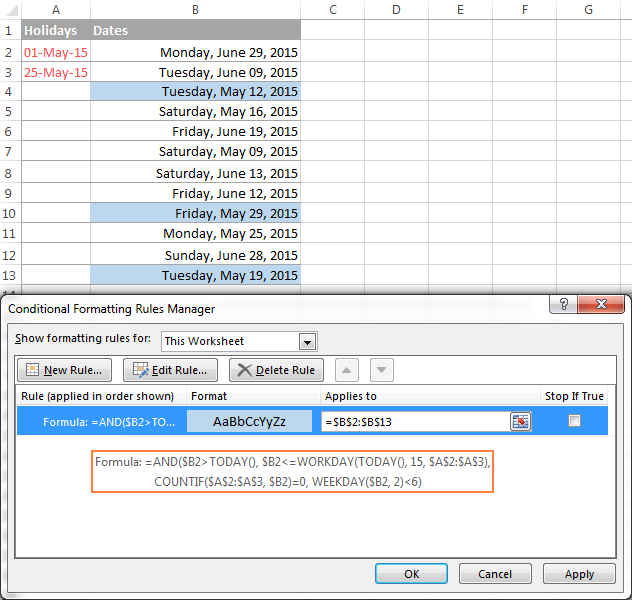 For this, you create a conditional formatting rule with either a WORKDAY or WORKDAY.INTL formula. Let's try to figure out why that happens. The problem is not with the WORKDAY function, as someone may conclude. The function is right, but... what does it actually do? It returns a date 15 workdays from now, excluding weekend days (Saturday and Sunday) and holidays in cells A2:A3. As you see, the WORKDAY and WORKDAY.INTL functions make calculating workdays in Excel quick and easy. Of course, your real-life formulas are likely to be more sophisticated, but knowing the basics helps immensely, because you can remember only a small set of essential things and derive the rest. I thank you for reading and hope to see on our blog next week! 65 Responses to "Calculating weekdays in Excel - WORKDAY and NETWORKDAYS functions"
I am having difficulties understandig the logic behind NETWORKDAYS being unable to return 0 (zero) working days when one uses the very same dates for start_date and end_date. Also, WORKDAYS seems inconsistent with NETWORKDAYS as it allows 0 (zero) as its "days" argument. This is the way the two functions are implemented. Sorry, it's hard to say why Microsoft decided not to coordinate them. What if we WANT to include the weekends? So our total workdays would be 7 instead of 5.. I was looking for this also and got this answer from a co-worker. You just add the number of days you need from the date in the cell, ex. =A1+25 and it should return the date that is 25 days from the date you entered. Worked for me. Am working with =WORKDAY.INTL(L6+1,C32/7.5,11,Sheet1!B2:B16) as listed below for project schedules the problem noticed is with the weekend when listed as 11 its not calculating as desired see in the month of march 27th is sunday. Even after assigning the 11 the result is given as 27th march 2016. which as per above weekends dates should result as 28th-Mar-2016.. Please review and suggest a solution. Thank you. My results for the NETWORKDAYS formula is not showing up as a numerical number. Rather in a date format m/d/yy. Result: 4/2/00 <-- I don't know what this means. Do I have my cells formatted wrong? How can I get my results to show as a number? I ran into that default issue. Just need to format cells as a number to see your results. I have scenario here. I have some engineers, who are working in two countries every month. I need to get available hours of each engineer in each country. Problem is, public holidays and working days of both countries are different. say in Country A, Saturday and Sunday are off, whereas in other country Friday and Saturday are off. similarly, public holidays are also different. Can someone guide me what logic should I use to cater this problem. Great it works. Thanks for providing with examples. I am also trying to figure out how to use this while including weekend days (7 day work week). Essentially I'm in a long-term medical facility and we want to know how many dates patients are served between admission and resolution of medical issue, but this can occur on weekends as well. I can't just add dates as in the example above for the same question, because the admission dates are not consistent to always add 2 days for the weekend, for instance. I'm not sure how to create a rule to bypass this situation. (I tried inputting 0000000 for weekend parameters, but it didn't work). What about wanting to use that formula but excluding holidays still? I have a scenario where I want to count the number of WORKING days a contractor has been on site from a start date to today (excluding weekends and public holidays), and then how many days of these that there has been works happening on site. 2.Saturday is the Weekly Off. I'm hoping for a solution to calculate the number of NETWORKDAYS between two dates, but to only display a value of zero or greater. Example: we want to count the number of days the contract delayed start of a project. Value A would be date of process kickoff. Value B represents date worker completed their paperwork. Value C represents when the contract was signed. We are trying to count how many days from when value B occurred until Value C.
In many cases Value C happened first so it did not cause a delay. Therefore i need the Formula to return a value of zero rather than a negative number. =IFERROR(NETWORKDAYS([@Received],[@[todays''s date]])-1,"N/A") I am using this fomrula to calculate a work date, and where there are blanks I would like it say N/A but it is placing "30472" on the line, how do I correct that? How is the formula look like if i would like to count two separate weekdays excluding hoiliday between a range date in one formula? I am currently using the below formula in conditional formatting to shade today's date and the next 5 days as yellow in a column of like 30 dates. Since the weekends are never listed, can we make those days not factor in so the count can go Friday to Monday and continue shading conditionally? If it can count Friday as Day 1, Monday as Day 2, Tuesday as Day 3, etc. I have learned alot here from this forums. So now, am having difficulties on how to computer for days that are adjustable. I want to calculate the days of a specific task. sometimes the task has not been done but I would like to develop a function that when the cell is blank to automatically use the current day. Can somebody help me with this. I ve found your tutorial very interresting. Right now I'm trying to dispay days of a month per week(a table for each week(from monday to sunday) of the month. A separate table for each week dispalying the day and the date with a title for each week(week from .... To ...). A1= Monthly Budget for a given Expense account. I have just been informed since this is for work, it must exclude weekends. Please advise how to achieve this. I need assistance and I don't find a way to eliminate 30536 when I use formula eg. Networkdays(B$2,today())and format as number its display 30536 if there is no date on cell B2. So how to make display zero for instance when there is no value on cell B2? Assume working 11:15 hours/day and 17 days/month,since i'm beginner in excel I use this simple formula(17*11.25) to get the result,but the result is shown in decimal.I want to display result in time hh:mm format. Is there a way to have the number of days worked show as 0 until and end date has been entered using the networkdays.intl formula. I know the start dates for my projects but the end dates are not know until the jobs are finaled. Hi, can anyone please tell me how I can add calendar days excluding bank holidays to a date in excel? For example, if todays date is 16 feb 2017 and I want to add 90 calendar days excluding the bank holidays on 14&17 April and 1 May the date returned should be 19 May 2017. Hi, Please tell me how could I add Saturday as working day and remove holidays. I want to use networkdays or workday formula. how would i include weekends and exclude holidays between 2 date time values (in order to find the total hours)? If you want to count all days but holidays, you can use DATE and then subtract the number of holidays. where F1 - start date, F2 – end date, E1:E14 - holiday dates list. can I use 0000000 to make all days workdays? If not how can do so? I have been trying to crate a formula to calculate only holidays without weekends. Good day to you all, I need help please. Given the durations, I wanted to indicate the start and finish dates of each activity with the following conditions. Sunday and Holiday - No work. Hope to receive your support guys. Thanks in advance. Thank you so much for this explanation, it helped a lot! I am using the WORKDAY function and want to include holidays. What if you want to select multiple columns with holidays, for example column B and column C? Is it possible to add this to the formula? I want to format an excel sheet, need the result of number of working days by providing start date and end date.but the number of working days is 6 instead of 5. i tried with =networkdays, it is calculating 5 days per week. this is for my company, to prepare the planning schedule. so, here 6 days per week and add all the national holidays in holidays list. it would be great, if you can guide me, first to set a calendar with all national holidays and all Fridays as leave. then if i make a schedule with refer this calendar, then we can prepare the correct schedule with proper working days. I like to remove the holidays. How would I get the end date? If I would give you give you the start date and the number of working days. the work timings are from 09:00 to 18:00 hrs. The NETWORKDAY(start_day, end_date, list_of_aug_weekends) is returning me exactly 8 days which is correct. multiply it by 8, will get 64 hours. but can any one please help me with a formulae on getting 63 hours. Any idea? workday formula just adds 3 days and make the time 12 A.M. and does not consider the time. 10/10/2017 is my last work day. I need to calculate total day has worked. (from 1-10th). however, I need to exclude weekend and Public holiday. what formula I should use? I need to calculate days a sample is overdue, and networkdays -1 works just fine unless the sample is approved on a weekend day. For example, a sample is due on Friday, and is approved on Saturday or Sunday. Just using NETWORKDAYS(W2,P2,)-1,0) returns 0 days late. But I need it to be 1, since technically it is approved after the due date. Any ideas? I have a spreadsheet with metrics for closed tickets. I want my column for "age" to be business days only, it currently includes weekends. I have a column with the opened date, and a column for the closed date. I tried plugging in NETWORKDAYS(start_date, end_date)but nothing changed. how can I Combine this in one sheet. How can I combine this in one Column. HELP PLS! I have a list of dates in Coulmn L and then a list of dates in Cloumn M. I want to be able calculate network days between L:L and M:M and if the difference is 3 don’t count. I then want to sum all the 1’s! I would like to do this all in one formula and without a helper column if possible. I have over the 1000 dates in column L and the same in coulmn M. Is this possible? I am using the "=NETWORKDAYS(A1,B1)-1" function to count working days between two dates. A lot of sites I've looked at say that this formula should give me a "1" if the date for start and end is the same, but I am getting a "0". How can I make the same day turnaround show a "1"? This way dates that are the same day or one day after will return a "1" (i.e. 7/11/2018 to 7/11/2018 = 1 day and 7/11/2018 to 7/12/2018 = 1). Please let me know. NETWORKDAYS counts the number of work days from the start date as a day. The formula that you are using "=NETWORKDAYS(A1,B1)-1" is built to subtract the current date from the result. So, when =NETWORKDAYS(A1,B1) using 7/11/2018 to 7/11/2018 would ordinarily return a 1 it will return a 0. The idea being that the person who uses that formula wants to say that there are 0 days difference from 7/11 to 7/11. If you use the formula "=NETWORKDAYS(A1,B1)-1" and 7/11/2018 to 7/12/2018 the result will be 2 days minus 1 day which leaves 1 day. It sounds as if you should use the regular =NETWORKDAYS(A1,B1) formula to get the result you want. Keep in mind the standard NETWORK days function won't count weekends so 7/13/18 to 7/15/18 will be 1 workday. You can also include holidays in the calculation if you have a list of dates to use as holidays. The standard NETWORKDAYS function looks like this (startdate,enddate,[holiday]) with holiday being an option where you can enter the address of your holiday list. I need to calculate number of days between today minus Holidays and Weekends and Dates in the past. How do i get workday from a date, e,g what is the workday on 12th December 2018 if Saturday and sunday are weekends? I am trying to calculate the difference between two dates. If date 1 is 2/18/2019 and date 2 is 2/19/2019 i get the difference of 2. But for my purposes it should be 0, because essentially the 2nd date was entered of the data was entered on 2/18/2019 but only provided to my org on 2/19/2019. I could do -2 but then it does not work when Date 1 lands on a weekend because I am using NETWORKDAYS. Date 2 never lands on a weekend. I think i need an IF function to -2 if Date 1 is a weekday. If date 1 is a weekend then it should only minus -1.